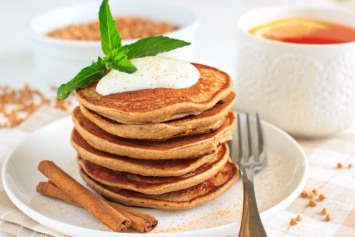 Here is a healthy pancake recipe, made with a selection of whole grains. You can use a variety of grains and I have made some suggestions below. It’s nice to know you can enjoy something that has always been less than a healthy breakfast, because now you have a new, much healthier pancake recipe. 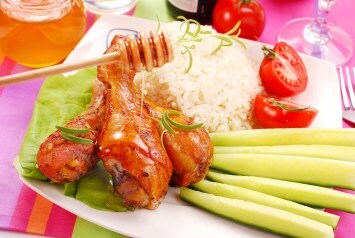 In a large bowl, place the milk, eggs, baking powder, salt and honey or sugar. Mix them together well. Stir the cinnamon into the flour mixture. Add the flour and/or grain, and beat to mix it all together. Beat only until the large lumps disappear. The batter may also be mixed in a blender and poured onto griddle directly from the blender. If your pancake batter is too dry to pour easily, add a bit more milk. Scoop the batter by large spoonsful onto a lightly greased skillet or griddle on medium high heat (375°F). Cook on one side for a minute or two until small bubbles appear on the top of the pancake. Then turn the pancake over and cook on the other side. Cook the pancakes until they are deep golden brown on each side. Makes about 16 four inch pancakes. You can use any combination of whole wheat, rye, soy, oats, millet or buckwheat, rolled oats, bran, wheat germ or cornmeal. Rolled oats, bran, wheat germ and cornmeal should be used in combination with one or more of the other flours for best results. My favorite combination is 1 cup whole wheat flour, 1/2 cup oats and 1/2 cup wheat germ and cornmeal combined. Use more wheat germ than cornmeal. The addition of a bit of cornmeal gives these pancakes great texture and a nice bit of crunch. Top your pancakes with your favorite syrup, a drizzle of honey, sliced bananas, strawberries and or blueberries. My personal favorite is applesauce. I love applesauce on pancakes. Much healthier than syrup too. And when you are done, yum. This is your finished product. How good is that? If you really want to be decadent, drizzle a bit chocolate sauce over your pancakes. It is especially good if you have sliced bananas on top too. Freeze extra pancakes and heat them in the toaster for snacks or busy morning breakfasts. The batter may also be made the night before and stored in a covered container in the refrigerator. Pancake batter should not be mixed until it is silky smooth. Like muffins, they can be overworked which makes them tougher. Nice, light pancakes come from batter that had been mixed just until the ingredients have been mixed together and there are still a few smaller lumps of flour in the batter. You can make this easy, healthy pancakes even healthier by adding chopped walnuts to the batter. Nuts are not only really nutritious, they taste great and add a nice crunch to the pancakes. Top them with sliced bananas, sliced strawberries or applesauce. Now that’s good eating. If you like this healthy pancake recipe, browse our other pancake recipes here. Rate this recipe above and submit your own recipe below in the comments section. I am sure others in the Cookingnook.com community would appreciate it.